Since 2008, the WDBC has provided a Handbook for owners of municipal and private systems that answers their questions as to how to achieve a successful design-build project. 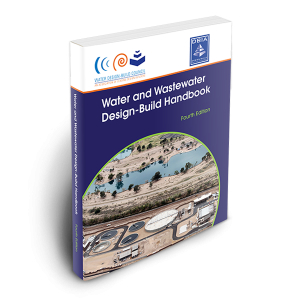 Now in its 4th Edition, this updated Water and Wastewater Design-Build Handbook is the most encompassing and descriptive ever produced. It continues to integrate the input provided by users on “information they said they need to know,” includes clear direction on applying best practices on the various collaborative delivery methods, for those responsible for procuring, designing and building water and wastewater capital projects — both in the public and private sectors. A new chapter presenting the steps to prepare an organization to pursue a collaborative delivery project, the need for inclusion of all representatives in the planning process – how to develop an overall implementation plan that serves as the roadmap for procuring and managing the project, and an organization chart and description of the roles and responsibilities of the organizations staff. A new section describing the roles and responsibilities of an owner’s advisor and how it integrates with the project. An updated chapter on managing design-build projects for clearer direction on the essential practices to effectively implement a project from procurement through construction. An expanded chapter on the transition process from the design-builder to the owner organization. A new chapter introducing the topic of public-private partnerships (P3) as it relates to collaborative delivery projects, specifically within the water and wastewater industry has been developed. Inclusion of DBIA’s Best Practices for Water Infrastructure projects reinforce the overall principles and guidance provided within the chapter topics. 30 new case studies provide examples of successful design-build projects of WDBC’s members. An expanded glossary and reference section guiding users to additional resources. The 4th Edition of the Water and Wastewater Design-Build Handbook is available as a complimentary copy to owners by completing the form below. it is also available for sale either as individual copies or a box of 24 – with payment made via credit card on this website.